This is a set of Art Chamber large size black ebony spikes impregnated with crystal ball. It is very suitable to be used as support for HIFI equipment, such as disc players, pre-power amplifiers or the speakers. 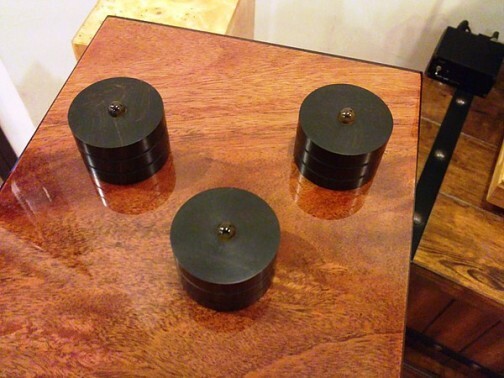 The black ebony used here are high grade Indonesian black ebony. When coupled with high quality crystal ball, they represent a perfect combination based on actually listening. Maximum load per set is 25kg. The set of spikes has the pure and transparent character of crystal, and also possesses the thick and dense sound of the black ebony wood. The cylinder finishing is fine and classy, nothing the generic cones can compare too. 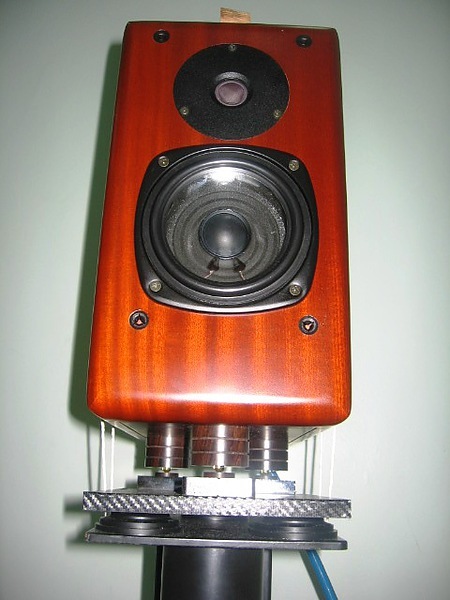 We tried the spikes at our bookshelf speaker, with one in front, and another two at the back. The sound gain more clarity, high frequency is more extended, and the sound is fuller and more rounded. 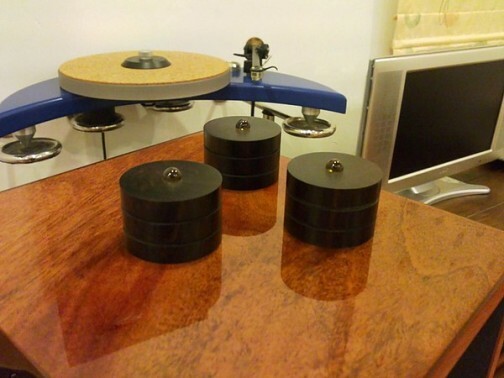 The ebony cylinder has excellent sound projection quality. The most obvious positive traits are the increase of spaciousness, layering, body and soundstage. This is highly recommended by Art Chamber. Don’t miss it! We’d like to thank Mr.L for sending over the actual applications pictures. Mr.L originally bought the spikes for equipment support. 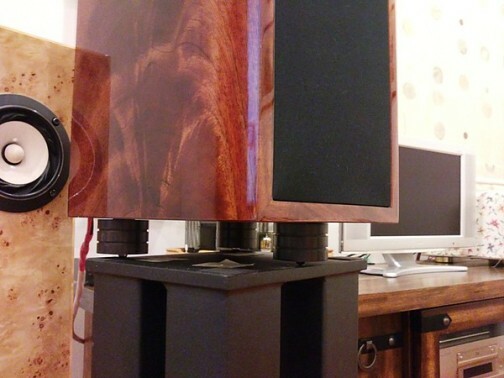 The effects are excellent and he bought another set to support his Opera bookshelf speakers. He rated highly for the spikes, just like what we described – spaciousness and detail increased significantly. 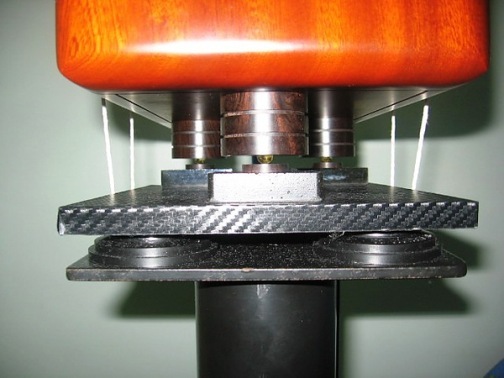 Apart from black ebony wood spikes, Mr.L uses carbon fiber board and Vibrapod to complement the setup furthermore. 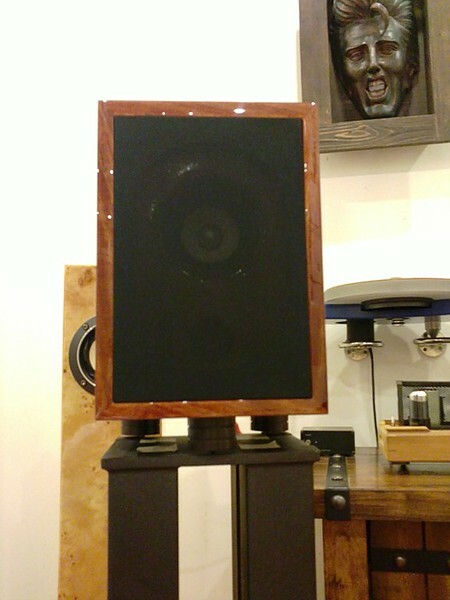 From the front, you can see that Mr.L uses the same configuration – 1 front, 2 back for the speaker support. 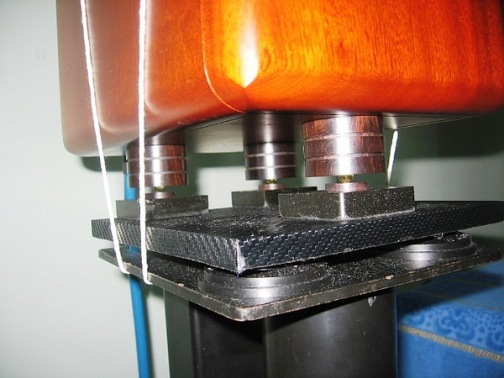 As Mr.L does not use any adhesive or damping material to secure the speakers, he uses strings to ensure the speakers do not dropped from the stand. Blu-Tac was suggested but it was not used as that might affect the sound / performance.